Winner of the Jury Prize at Cannes and shortlisted for the Academy Award for Best Foreign Language Film, Capharnaüm certainly comes with a weight of expectations associated. The film accounts the journey of 12 year old Zain Al Rafeea, as we meet him imprisoned, and having his day in court. However it is not for his own crimes, the stabbing of a man which he is already serving a sentence for, but rather to sue his own parents. 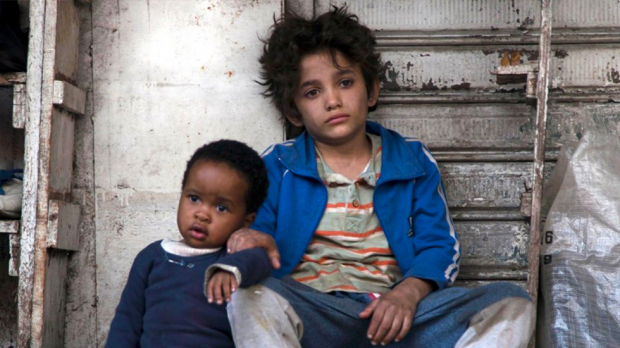 Through the trial we see the passage of Zain through the slums of Beirut, as he flees his own impoverished family, and with the help of an illegal migrant (Yordanos Shiferaw) tries to make a life on the streets. The central performance of Capharnaüm is stunning, especially given that Zain was only 12 years old himself at the start of filming. He projects a fierce intensity with the character, a battered resilience, yet also shows a caring love to the children often placed in his charge. Tragically that intensity is born out of the actor’s own hard early life, as director Nadine Labaki attempted to cast her actors from the street, and draw from their experience, rather than professional actors. The result lends Capharnaüm an undeniable authenticity. That exploration of the plight of the poor and powerless, those struggling without identities, unknown, unwanted, and unloved – is the sorrowful heart of Capharnaüm. It is not merely the struggling child Zain’s story, but his destitute parents, the illegal immigrant, the child bride, and the helpless toddlers that make this film such a powerful plea. At times it is almost oppressive in the poverty portrayed on screen, but this is only a small taste of what it must be to live like this everyday. If there is a fault, it may be that the film is too wide in its scope. In covering the various plights of a number of its characters, it becomes somewhat diluted both in terms of narrative and impact. Although this stretching of the narrative might have some thematic purpose (such as Zain finding himself forced to repeat many of the mistakes of his parents due to his dire circumstance), it does lessen the power of the film. A sobering neo-realist fable that casts an eye over the forgotten and powerless in society. Breathtaking, confronting, and enlightening. Capharnaüm plays at UWA Somerville from Monday, February 11 to Sunday, February 17, 8pm, and at ECU Joondalup Pines from Tuesday, February 19 to Sunday, February 24, 8pm.